A donation of $25,000 to the United Nations Relief and Works Agency (UNRWA), which helps Palestinian refugees abandoned and abused by Israel, may not sound like much. But it is. Each celebrity selected a charity for their money and Penn chose to help Palestinians, a people who expelled from their indigenous country, Palestine, when Israel was created there in 1948. Israel continues to refuse to recognize Palestinian refugee rights and maintains an ongoing, multi-million PR campaign that began in 1949 to “spin” facts to make Israel look better while making Palestinians look bad. The Israelis and their massive investment in communications have done a good job of achieving that, considering Israel receives billions each year from the United States and blind loyalty from many one-sided journalists who are Jewish, Israeli or just simply biased pro-Israel. How many Arabs or Palestinians, specifically, write columns or work for major news media in this country? It’s miniscule in part because Arab culture doesn’t encourage their young people to pursue journalism or communications careers. Communications and the information media in all its forms – news, entertainment, movies, TV and radio – are so important in molding the opinions of the public, especially the American public. That 1958 novel became a popular movie in 1960 starring Jewish actor Paul Newman. More importantly, it set-in-stone the narrative of how Americans would view the Palestine-Israel conflict. Of course, Palestine had people. In November 1947, when the UN partitioned Palestine into “two States,” there were about 1.1 million (58 percent) Muslim Arabs, 145,000 (8 percent) Christian Arabs, and 608,000 (33 percent) Jews. Yet, the UN gave the Jewish residents 56 percent of Palestine and the “Arabs,” Muslim and Christian, only 43 percent even though the Arab population was twice as large. Does anyone wonder why the Arabs rejected the UN Partition Plan and Israel’s founders accepted it? We all know these facts, but Israel did a better job of presenting them to the world. The Israelis did their homework, the Arabs did not! That hasn’t changed since 1947. Israel continues to reinforce these myths while the Arabs and Palestinians mostly spend “their emotions” yelling and screaming at Israel. Every once in a while, something happens that makes Americans wonder what’s up? Like when Penn donated his winnings to the Palestinian refugees? Is he some kind of terrorist, according to Israel’s PR propaganda? No, he’s a conscientious successful individual who knows that while $25,000 won’t solve Palestinian refugee problems, it will give the Palestinian refugees a public boost. Sadly, though, not every media covered the story, although UNWRA distributed a well-written press release to everyone – most Arabs simply don’t know how to write a basic press release, and even more don’t think things like press releases, strategic communications and professional media spin have any value. Press releases do have value. Significant value. Despite a brilliantly written press release from UNRWA, most of the coverage of Penn’s generosity was in the Arab and the Israeli media, and only a few American media covered it at all. Other celebrities have also done much to help the Palestinians like actress Whoopi Goldberg, modern-day Einstein Stephen Hawking, actress Emma Thomson, and Pink Floyds singer Roger Waters among others. The first, though, was Vanessa Redgrave who helped produce a documentary showing the just cause of the Palestinian people. Redgrave won an Oscar in 1978 for Julia, a film that portrayed the suffering of Jews during the Holocaust, and during her acceptance speech she mentioned the “Zionist hoodlums” who protested outside the Academy Awards. Anti-Arab Jewish producer Paddy Chayefsky denounced Redgrave and so did most of the American news media. Nearly one billion people saw and heard Redgrave’s speech condemning anti-Palestinian terrorists. But she suffered for her courage. Very few Arab media and organizations made strong public efforts to come to her support. I know I sound like a broken record. But the failure of the Arab World to take strategic Public Relations and its sister profession Public Affairs seriously has undermined and damaged the cause of Palestine more than any other single act. It’s not just Palestine that suffers. The Syrian refugees, who are being brutalized by the brutal military alliance of Syria, Russia and Iran, are suffering because of the weak PR campaign. The many great things that some Arab countries like Saudi Arabia do for the American people (holding down the price of oil and thus gasoline thereby strengthening the American economy) is suffering. Americans just don’t know. Not because they are stupid. But because Arabs are just not doing professional or strategic PR. Thank you Kal Penn for your generosity. One day I hope the Arab World will see it for what it is, a principled act that deserves far more coverage and respect. It’s an example of how we might educate the uneducated American public about what’s happening to Palestinians. THIS POST HAS BEEN READ 4148 TIMES SO FAR. THANK YOU! 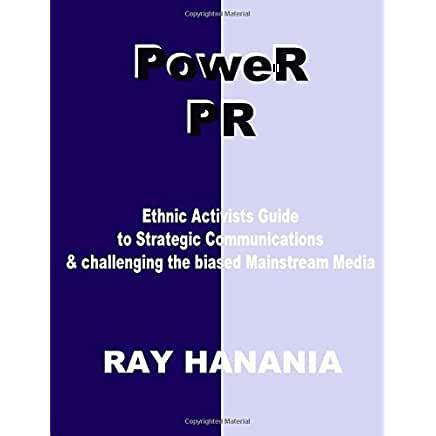 Ray Hanania is an award winning political and humor columnist who analyzes American and Middle East politics, and life in general. He is an author of several books. Hanania covered Chicago Politics and Chicago City Hall from 1976 through 1992. Hanania began writing in 1975 when he published The Middle Eastern Voice newspaper in Chicago (1975-1977). He later published “The National Arab American Times” newspaper which was distributed through 12,500 Middle East food stores in 48 American States (2004-2007). Hanania writes weekly columns on Middle East and American Arab issues for the Arab News in Saudi Arabia at www.ArabNews.com, and at www.TheArabDailyNews.com, www.TheDailyHookah.com and at SuburbanChicagoland.com. He has also published weekly columns in the Jerusalem Post newspaper, YNetNews.com, Newsday Newspaper in New York, the Orlando Sentinel Newspapers, and the Arlington Heights Daily Herald. Palestinian, American Arab and Christian, Hanania’s parents originate from Jerusalem and Bethlehem. Hanania is the recipient of four (4) Chicago Headline Club “Peter Lisagor Awards” for Column writing. In November 2006, he was named “Best Ethnic American Columnist” by the New American Media. In 2009, Hanania received the prestigious Sigma Delta Chi Award for Writing from the Society of Professional Journalists. He is the recipient of the MT Mehdi Courage in Journalism Award. He was honored for his writing skills with two (2) Chicago Stick-o-Type awards from the Chicago Newspaper Guild. In 1990, Hanania was nominated by the Chicago Sun-Times editors for a Pulitzer Prize for his four-part series on the Palestinian Intifada. His writings have also been honored by two national Awards from ADC for his writing, and from the National Arab American Journalists Association. The managing editor of Suburban Chicagoland Online News website www.SuburbanChicagoland.com, Hanania's columns also appear in the Southwest News Newspaper Group of 8 newspapers. Click here to send Ray Hanania and email.